« Could Dubai’s Theme Park Bubble Burst? There are very few sites that hyped up Motiongate Dubai like we have here at Theme Park University. It’s nearly impossible not to be excited about attractions featuring brands like The Smurfs, Ghostbusters, Hotel Transylvania and many more. 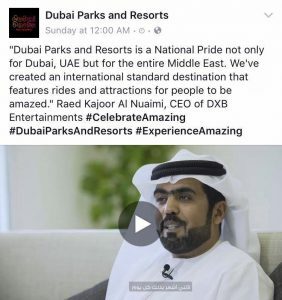 Considering this was only one park in the Dubai Parks and Resorts entire property, which also includes hotels and a dining/shopping district, the scale of the project was the largest in the history of the themed entertainment industry. Unfortunately, it looks like the park bit off more than they could chew. Videos have already been released from a handful of the park’s signature attractions. To say they are disappointing is an understatement. These attractions that have opened so far are flat-out embarrassing. Ready to dig in? These videos are courtesy of Theme Park HD YouTube channel. Below is a complete ride-through of GhostBusters: Battle for New York, including the queue. Enjoy and good luck. If you were able to get through those five minutes without shaking your head? You are a far better person than I. To have a ride vehicle slowly crawl roughly 20 feet and park, crawl 20 feet and park, etc. makes me sad that this is where we are in 2016. If the idea is to go between screens (the majority of which can be seen after leaving the load area), then let guests travel the building by foot. Forget the fact that the scale of the sets are off in comparison not only to the screens, but of New York City. That can be forgiven. However, the quality of the graphics and the ghosts created are horrendous for a film franchise known for their brilliant not to both funny and frightful spirits. What you’re busting adds no value to the overall story and ends up making the entire project look cheap. It’s the immersive sets of a high school play combined with the charm of Nintendo Duck Hunt. Speaking of cheap, feast your eyes on the Smurfs Studio Tour. It may be the worst dark ride of the last 25 years. Yes, there are some technical glitches in the attraction and, considering the ride is new, we can ignore those for the moment. The real crime here is the lighting and the sets. There is nothing wrong with static characters and the sets, for what they are, aren’t too bad. However, there are no transitions at all between scenes. Just black wall and even the door leading to ride vehicle storage is appalling. The lighting of the ride gives all the charm and ambiance of a Costco. If you can stomach it, enjoy the last dark ride video available: Hotel Transylvania! Easily the best of the dark ride videos out there, the sets are very intricately detailed and the characters are spot on. If this were the standard motiongate Dubai was holding, it may not be so bad. What kills it is the trackless ride vehicle and how the scenes are presented. Sorry fan boys, trackless ride vehicles are not the end-all in a theme park experience. These crawl around at a snail’s pace and never enhance your experience. Furthermore, you can see nearly every single scene in the warehouse of a building before you even enter it. Simple doors that the vehicles push through (no actuators necessary!) would solve a lot of the issues with this attraction. Before we go any further, let’s be clear on what the problems with motiongate Dubai are not. First off, no park should operate with nothing but E-ticket attractions. You need a fair mix of moderate thrills, classics like carousels and a few bigger-budget attractions. Also, this was never about Disney or Universal quality or budget, nor was it expected. This is a new park in a new region and spending that kind of dough would be absurd. So who is to blame? Hard to say and, frankly, it could be spread out to multiple sources. For the studios who hold the intellectual property rights, surely some blame must be placed on them for seeing the plans and allowing a sub-par product to open has to be given to them. From the design side, even though plans change and so does the budget, the final product does end up representing the design firm who creates these projects. I’ve done enough research to know that certain companies back away from projects and deny having any affiliation to not tarnish their name. Meaning most of the blame can be shifted to the park’s owners and investors. I’ve been told for years that the folks who want to build theme parks in Dubai love visiting Orlando and basically say, “I can do that too,” without having the knowledge and resources on how projects like this get done. The results can be seen in the videos above. There have been multiple red flags along the way with this project, including multiple opening day push backs and some lackluster marketing, but the finished project is starting to speak for itself: not many people will be flying to Dubai to experience this. Finally, don’t give up hope. Keep in mind, these are only three videos out of an entire park. 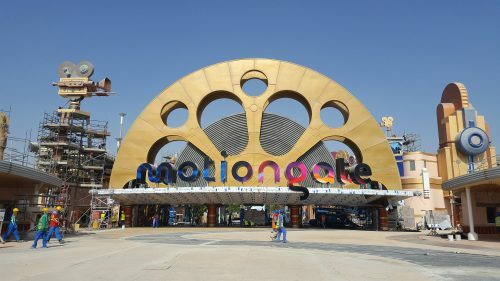 Motiongate Dubai also spent a lot of money on their entertainment offerings, something most new theme parks add in later phases. These live entertainment offerings could be the saving grace for the park. It’s also worth noting that this is one of the only theme parks in the region right now, so there isn’t a lot of competition. But we know that things are only going to heat up from here. Your thoughts? This entry was posted in Theme Parks 101 and tagged Dubai, Ghostbusters, motiongate dubai, smurfs, theme parks. Bookmark the permalink. Trackbacks are closed, but you can post a comment.